This seems to be the latest craze, although I am not sure if it has made its way from America to our Australian shores just yet. Where you knit something and then bomb the area with your creations. Some people like to leave little notes for the people who find their knitting. What a lovely way to cheer up a strangers day. Yarn bombing, yarnbombing, graffiti knitting, guerrilla knitting, or yarnstorming is a type of graffiti or street art that employs colorful displays of knitted or crocheted cloth rather than paint or chalk. 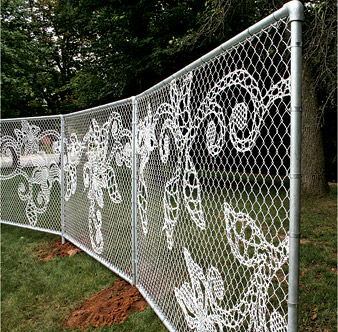 While yarn installations – called yarn bombs or yarnstorms – may last for years, they are considered non-permanent, and, unlike graffiti, can be easily removed if necessary. The practice is believed to have originated in the U.S. with Texas knitters trying to find a creative way to use their leftover and unfinished knitting projects, but it has since spread worldwide. 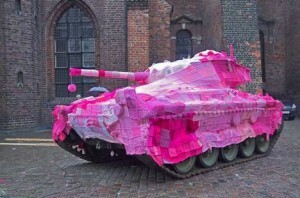 While other forms of graffiti may be expressive, decorative, territorial, socio-political commentary, advertising or vandalism, yarn bombing is almost exclusively about reclaiming and personalizing sterile or cold public places. 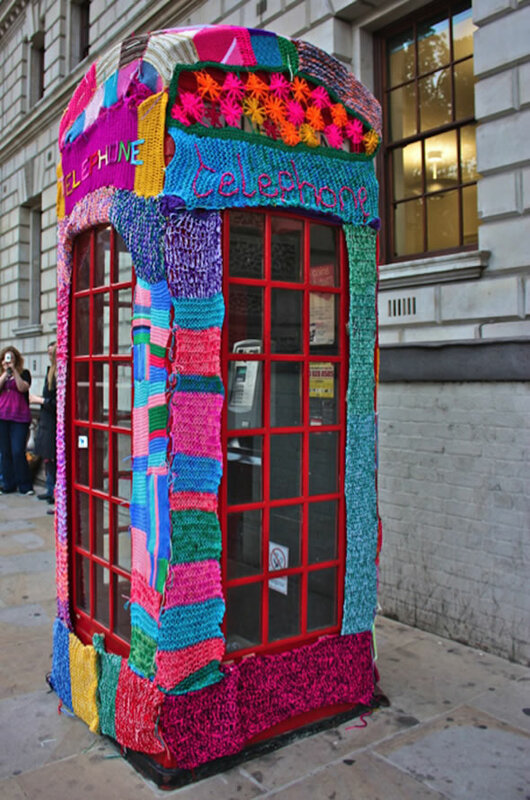 When you google Yarn Bombing and click on Images, you see so many beautiful things people have knitted. Some creations must have taken ages (see tank cover below) and others are just a simple colourful touch to a rusty old pole. A book on how to Yarn Bomb. Jerry Kaba, 30, holds his girlfriend Jessie Hemmons, 23, up on his shoulders, as she knits a sweater on a tree in Rittenhouse Square. ( Sharon Gekoski-Kimmel / Staff Photographer) March 24, 2010.